Art is the new Tango! I can’t believe I just wrote that. And I never thought I would have a passion for anything outside of Argentine Tango. Admittedly, my passion has eased off since I moved to Eastbourne over a year ago. There is no Argentine Tango to be had here in Eastbourne. I have had to make do with other dances, go back to old favourites, and try a new one. As a social dance, Argentine Tango is my preferred dance of choice as it is not just about the dance, it is about the music and the connection with another. If you want to know all about my passion for this wonderful dance and the music that inspired it, please have a look at my other blog. I suppose something had to give. Maybe the passion for dancing was to fill a void. Salsa, Ceroc/LeRoc, and Bellydancing don’t quite reach the part of me that the music of Argentine Tango does. It touched my soul. The other stuff is just for fun and gives me a happy vibe, but it is a fleeting thing. However, dancing has now taken a back seat to drawing and painting. I still dance, but it isn’t that important anymore. I discovered painting after a break up earlier this year. You see, I never thought I had it in me, but it seems I do. Other people seem to think so too, and I’ve been offered a place at my local college for the Art Foundation Course. So, now I am doing things with regard to painting and drawing as I did when I was learning to dance Argentine Tango. I looked at resources on the internet. I am reading books. I go to a couple of classes. I am painting and drawing something everyday. It is my new obsession. I used to laughingly say that Tango was my life, and that was because I danced 5-6 times a week for three years! I have enough Art Supplies, I could open up my own shop. Instead of buying Tango shoes and clothes, I buy paint and pencils and I just ordered some paper stretchers! Right now I am painting anything and everything, but mainly naked people, fruit and veg, and flowers. I have done a few abstracts and have a few ideas to work on over the summer. I was given a project to do for the Foundation Course which will be reviewed tomorrow. I am learning in a way that I always like to learn something I am interested in, and that is by immersing myself totally in it. Unlike dance, there is a lot one can actually learn and apply to one’s art by reading books and watching videos on the internet. Although most artists that pass on information have developed their own techniques or methods of doing things, the foundations are generally the same for everyone. I have realised that as in dance, less can be more when developing a piece of work. As I am unskilled and still finding my feet (so to speak), I still need to learn about how things work and how to put things together, in my own way. Hence the Foundation Course. In the meantime, I am teaching myself things from books and trying out different methods of doing things, making a note of it and disregarding stuff I don’t like. I have a lot of time to do this before the classes start in September. I have been an art lover from an early age. I used to love watching my father paint and draw. He could do it with either hand. His skill overshadowed my desire to pursue anything with Art, except to appreciate it. When I was 17, my English Class took a trip to New York to visit The Metropolitan Museum of Art. It was my first ever visit to an art museum. It was a glorious summer day. Most of my classmates bunked off into Central Park to hang out and go drinking while a few of us actually went around the Museum. I was overwhelmed by the beauty of what I saw. I guess you could say that was the day my soul was touched by Art. From that day, I would visit Galleries and Museums every chance I got. When I actually lived in New York, I was in Art Heaven. I could walk to the MOMA on my lunch break! When travelling, I will generally try to visit a gallery or museum. I find it difficult to be indoors though when the weather is so nice, so I enjoy the Architecture instead, which is sort of like Art. Living in London for over 20 years was wonderful for all of the lovely Art and Architecture to be found. Now I live in a genteel seaside town that has a wide variety of creative people in the vicinity – and we have an Art Gallery, The Towner. Living by the seaside and the The South Downs is very inspiring. I have taken many lovely photographs of the area. I am sure I will find some inspiration that will get me to produce a piece of work because of what I have seen or felt. Right now, I am having a lot of fun working with colour. I have been using a lot of it in my interior decorating, and now I am using it to paint. I am not interested in painting something ‘life-like’. I want whatever I make to be more than what it is. Without going into crappy and pretentious Artist’s jargon, I want to bring more to a picture than what I see – because I not only see what I am painting, I feel it and strangely have a connection to it – even to the fruit! The melon I painted today came out differently because of the variations in the colours of the different mediums I was using. However, it got more vibrant. The fruit became more than what it was. It is strange, but I am having fun! And I am happy! Taken with a Canon Power Shot SX200 IS on Indoor Mode. Specs: 1/13s, f/3.4, ISO: 320. I don’t have an inspiration board, I have a wall instead. And yes, it is that pink. 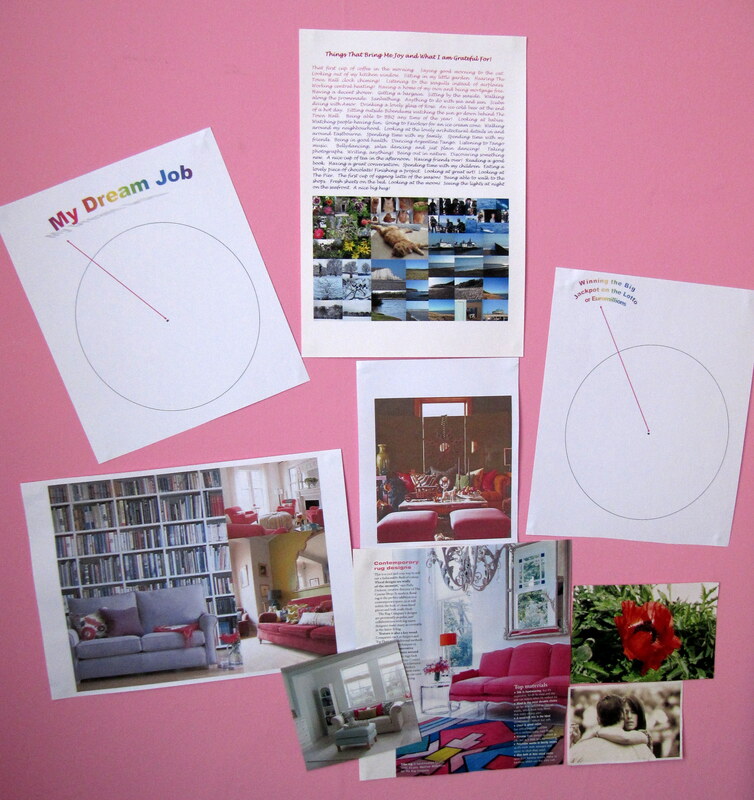 My study has one pink wall and the rest is cream. I call it candy pink. It is growing on me, but when I redecorate the wall will be a soothing turquoise. My friend Sallycat set up a page on Facebook called Happy Hearts Quest. One of the tasks was to write a Joy list. I wrote a ‘Things that bring me joy and what I am grateful for!’ list. (It is right up there between My Dream Job and Winning the Big Jackpot on the Lotto or Euromillions.) I do one or more of those things on that list every day. By offering gratitude for what we already have, we allow the Universe to give us more. If we think of what we want as a little spec inside the vast Universe, what we want doesn’t seem so huge or unattainable. Going back to my Joy list, I used the computer to make my list as my handwriting is not that great and I didn’t have coloured pencils or pens to make it pretty. I made a photo collage of my favourite photo collages to add at the bottom of my list, which are some of the things that bring me joy and what I am grateful for. I could add more, but I would need a bigger printer for that! The pictures of furniture are ones that are inspiring my decorating at the moment and what prompted me to go with my heart on ordering my fuchsia sofas. In the sofa collage on the left, the lilac sofa in front of the bookcase is the style I ordered. There is a photo of a California Poppy taken at my previous house which my daughter took on my camera and a photo someone took of me dancing Argentine Tango with my friend Alfredo at the very first River Tango in front of The Tate Modern. I will most likely take more photos of my wall as and when things get added, removed or attained! So, what’s on your Joy list?